Confession: Earlier this year, Pra found that she’d indulged a bit too much over the festive season and getting back into the gym ritual was a challenge, to say the least. I overdid it on food, drink AND the wallet, which meant that I wanted to tighten up those “bingo arms” without having to hide from my monthly credit card statement. On top of that, my work schedule was HECTIC, and I knew I would be susceptible to the old “I’m too busy today” excuse. A HIIT workout that can be squeezed into 30 or 45 minutes? Count us in. This is a workout you can fit into a busy schedule and the high intensity of it makes it effective in that short period of time. It’s also low impact, making it easy on your body. Soon after that, I tottered down to the hotel to meet Kayleigh Dawson, Centre Manager, and her team to learn more about how I could drop the weight without dropping too much cash. I was keen to find out if this might be the magical sweet spot for workouts. 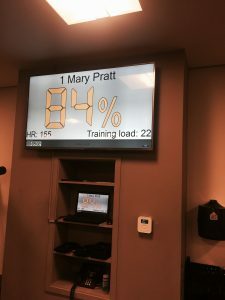 Could I swap out the 1.5-hour gym and cardio session for a 45-minute one while upping the calorie burn? 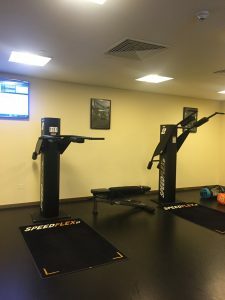 When I arrived at Speedflex, the first step was doing a body assessment. My trainer Jack greeted me and whisked me off to the assessment centre where we measured my weight and height, followed by a thorough body composition analysis. This is where I found out that doing bicep curls with glasses of wine isn’t a suitable workout, and I cringed when I realised how much muscle mass I had lost over the holidays. Jack then sat me down and explained the different figures, such as the visceral fat areas (fats around the organs), and weight v. skeletal muscle mass v. body fat mass. In the past, this service has cost me a few hundred AED in Dubai, so I was quite impressed that it was included. Plus, it gave me a much-needed kick in the backside. Pra was on a mission again! 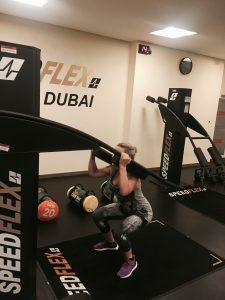 We headed to the training room, which held around seven or eight Speedflex machines that all looked the same but had uniquely different uses, from squats to bench presses. These machines basically personalise the resistance to your strength, so the harder you push, the heavier it becomes. You get what you give in this workout! But the goodness didn’t end there. Not only would I be burning calories and improving muscle tone and strength with the promise of no aching joints the next day, but I’d also be able to know just HOW hard I was working. How? By attaching a Polar heart rate monitor to me. Once attached, your details are logged on a screen which shows your heart rate and the intensity at which you’re working. So in short, when you hit the RED zone (which is 90%+ of your max heart rate), you’re working at your maximum capacity. Jack demonstrated each of the exercises to our small group and then we kicked off our circuit training session. He pressed a buzzer that started 25 seconds of activity, and when we heard a beep, we moved onto the next machine. Keeping in mind that I’m no stranger to a hard workout, this was tough! But only in the best way possible because I KNEW how hard I was working. Having your stats flash across the screen means that it keeps you honest (you’ll know when you’re not pushing yourself). I’m all about visible targets and this was exactly what I needed. Not keen on the idea of working out in a group? Don’t panic, this workout experience is anything but embarrassing. Everyone may be at different fitness levels but it’s all about motivating each other. 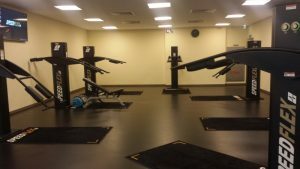 Also, the intimate class size means that you can meet some new workout buddies while getting super toned, whether you are a lady of leisure or a business professional. If you do 3 Speedflex sessions per week and keep a healthy balanced diet, you’ll undoubtedly see some great results within 3 months. Fret not, if you like variety, you can try one of their other classes, such as Pureflex, Coreflex or Bodyflex. Who’s it for? EVERYONE. That’s the beauty of it. Men, women, athletes, those with medical conditions – Speedflex tailors to YOU and your abilities. I wish they’d launched a few years ago when I was being run ragged in the corporate world. Fitting 45 minutes into a busy schedule is utterly achievable and if you’re so inclined, there’s an open terrace restaurant called Sehr Al Bahar conveniently located next door, where you can grab a drink and unwind post-workout. But, of course, you’ll be opting for a green juice, right?